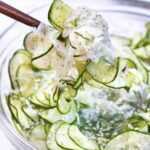 Garden fresh cucumbers sliced incredibly thin with white onion make this Asian Cucumber Salad incredibly light and refreshing! Oh, cucumbers. I love you so. Even more now with this Asian Cucumber Salad. Our cucumber plants are doing so well this year, I’m pulling at least one a day! Heaven. I grew up snacking on raw cucumbers and tomatoes from our garden. My first apartment after high school when I was 18 started in the summer after graduation and I remember the first time I went to the grocery store to go shopping for myself, all by myself like the ‘adult’ that I thought that I was, I was appalled at how expensive produce was. AND how terrible it tasted. I had been so spoiled my entire life growing up with my dads huge gardens where I could prance down there, grab some tomatoes, cucumbers, or whatever other veggies I wanted whenever I wanted them. So anytime I visited my parents, I was sure to take a care package of fresh veggies home with me. Since then, I’ve moved so much, lived in so many little apartments, or have just been way too busy to have a garden. This year though I am soooo excited that not only were we able to have a garden, but we have one that’s doing so well! Since I still had a bunch of pickles, last night I decided to make one of my favorite go-to, super fast, super easy, and really healthy salads, an Asian Cucumber Salad. Even better, we finally have a mandolin! My studly husband got me this bad boy for our anniversary. To which he said, “I know some people may balk at me buying you kitchen appliances (I got a sweet point and shoot thermometer too for cheese making! ), but I know my wife,” And he does. I love this mandolin so much; I can’t believe I went so long without one! If you don’t have a mandolin you can just slice the cucumbers super thin. Then I just added some super thinly sliced onion, minced dill, toasted sesame seeds, salt, and rice wine vinegar. 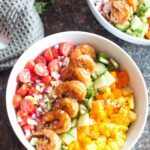 A good mix and 20-30 minutes to marinade in the fridge and we had a wonderfully flavorful and healthy side salad for dinner! I also took leftovers to work with me for lunch which allowed even more marinade time.I love love love this Asian Cucumber Salad. 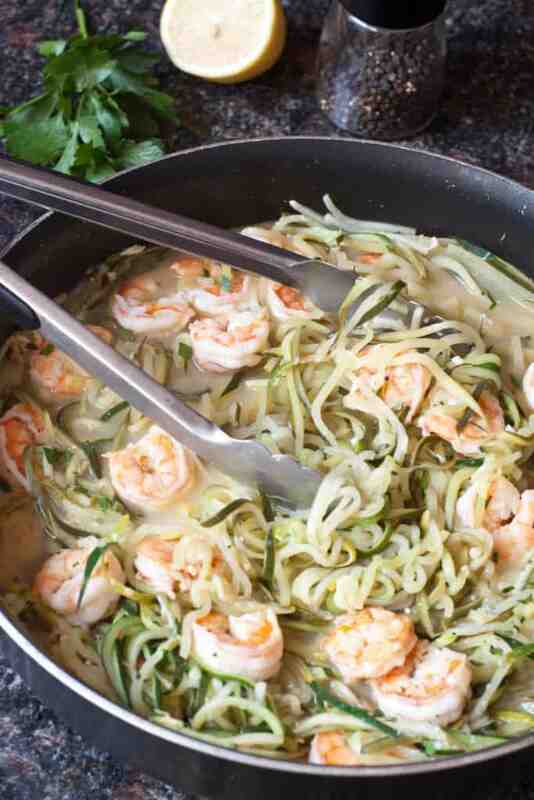 So summery, so fresh and light, and you can beat a salad made from home grown cucumbers! 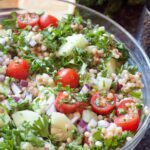 I make this salad non-stop in the summer, every year and it gets better each time! Or maybe my cucumbers get better every year. Either way, this recipe is a summer staple in our house. 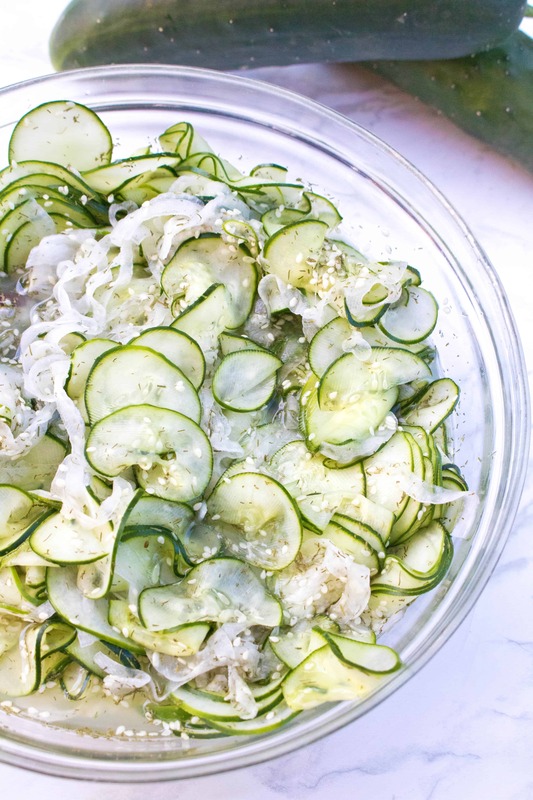 Have you made this salad with some of your fresh or farmer’s market cucumbers? I’d love to hear about it! Follow me on Facebook, Pinterest, and Instagram to share your Served From Scratch creations! 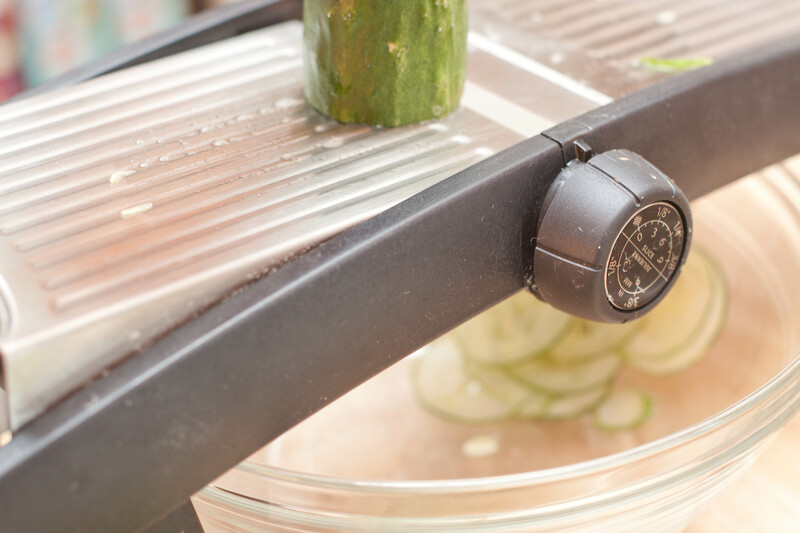 Slice cucumbers and onions as thin as possible (with mandolin or by hand). 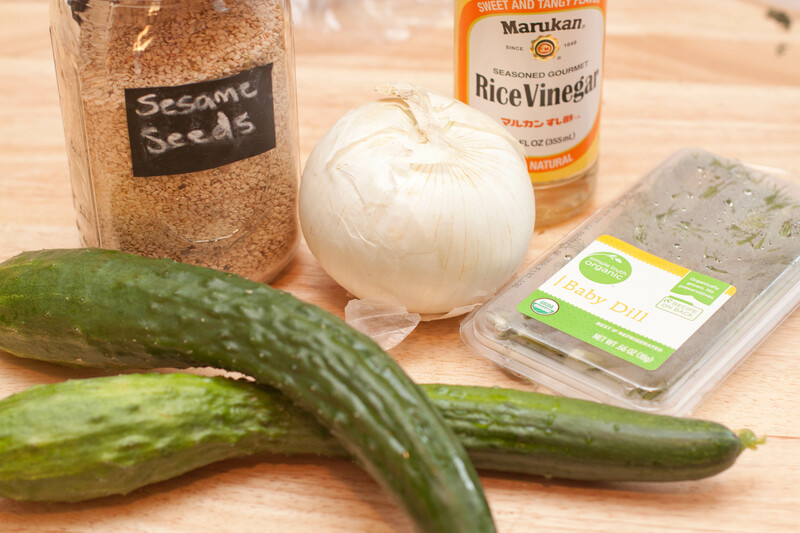 Add to bowl with dill, salt, sesame seeds, and rice wine vinegar. Mix well. Cover and refrigerate for at least 20 minutes. Looks like a great way to use up the piles of cucumbers I’ve been getting from my CSA. Thanks! I’m so happy for you that you get to have a garden this year. We love our garden, too! I have never had much success with cucumbers, though. A lot of times they have come out very bitter, and I’m not sure why. Arizona may not be a good place to grow them, or I just have no idea what I’m doing which could be the case! :) Your salad looks so good! This looks great. I love all kinds of cucumber salads, unfortunately our cucumbers are done. I miss them so much! great salad! i love cucumbers. I want to make like a million gallons of this!!!! this is such a refreshing idea for a salad!!! 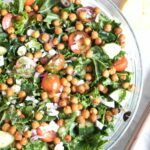 I love how pretty this salad is and it sounds delicious! Perfect for warmer days too! Can’t wait to try this recipe this summer! It looks so fresh and flavorful! I really would like to have my own garden and grow veggies! The quality, the taste, everything about home grown veggies is just better than store bought! How come I never tried dill with cucumber? i should really try this! This looks so yummy! I love cucumber, so simply but so yummy and refreshing! I’m very jealous of all your access to home grown veggies! 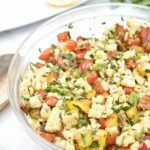 This looks so light and healthy, perfect for summer! This reminds me of many meals I have had out, but somehow I haven’t made it at home. So easy, so really should give it a try! I am a huge cucumber fan and this salad is Awesome! So fresh and tasty! Can’t wait to put this into my meal plan! 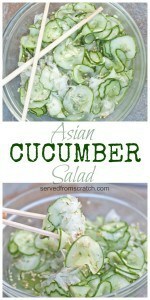 I love Asian cucumber salad but never tried making it at home! Looks and sounds so delicious and I love how easy it is to make! That looks really good and I bet it’s a refreshing salad. Thanks for the recipe. 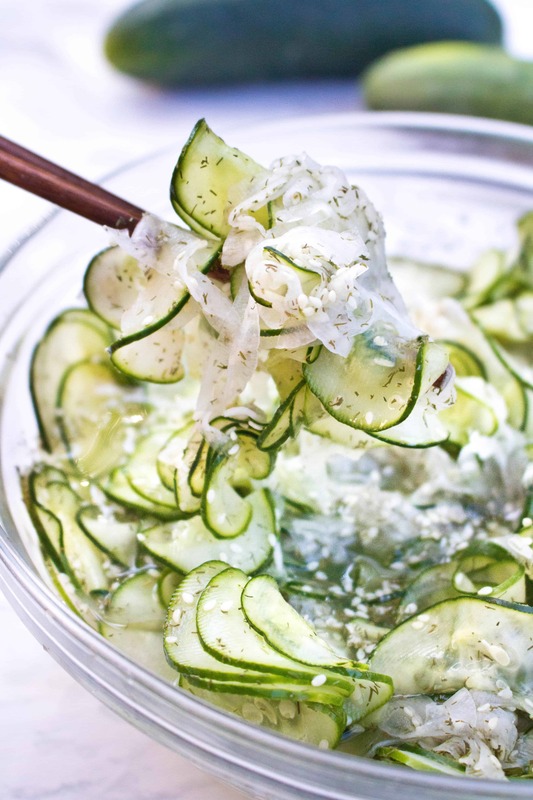 Cucumber salad is a big favourite of mine and I love the Asian flavours in this recipe. So delicious! Cucumber is really one of the best salad ingredients! 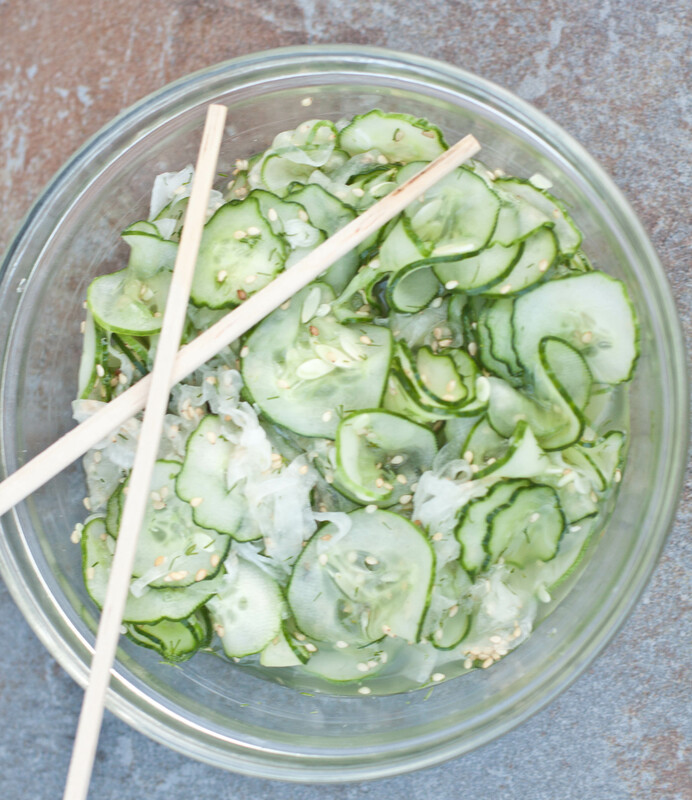 This Asian cucumber salad looks so refreshing. Def one to try! Going to pin for later! Salad is such a healthy option for any meal. Cucumber too is a great option for a salad filler. Will make this salad tonight for Dinner. This is so simple to make too. This is such a great twist on the classic cucumber and onion salad that is so popular in the summer months. I definitely want to try your version. I love sesame seeds. Why have I not made this before?! I love cucumbers and Asian flavours. Thanks for sharing!